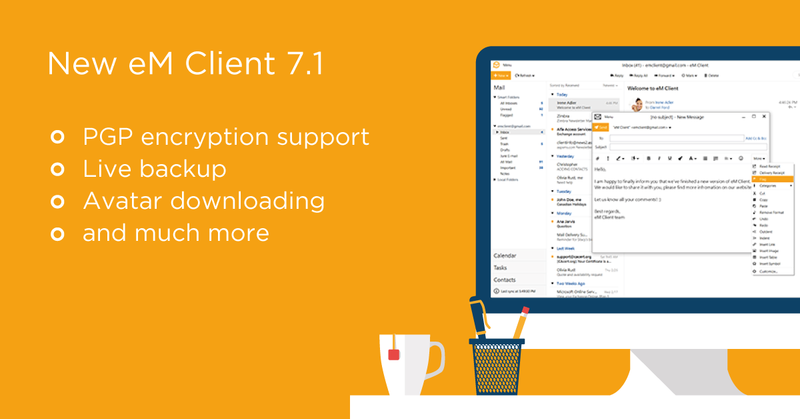 eM Client 7.1 is here! After having carefully examined your feedback, we’re now bringing you a number of new features and improvements of the old ones. If you already have a valid license for eM Client 7, update for free now! eM Client 7.1 is bringing some frequently requested features and enhancements to improve the quality of your workflow. Here is a list of some of them. You can now encrypt your emails with PGP encryption, ensuring unbreakable security. We support both PGP Inline format and PGP/MIME. Our new interface makes managing your S/MIME and PGP certificates and keys a lot easier. You no longer have to exit eM Client in order for the backup to proceed. eM Client will now back up while running so you can keep working even while it is underway. eM Client now automatically downloads and displays avatars for your contacts from the web. We download from Gravatar, domain icons and more. The print preview has been completely remade and is a lot easier to use. PDF files generated by the print dialog will now have searchable text. We’ve added a lot more customizable buttons to various toolbars in eM Client. Your pasted images will now automatically be resized to fit in your email. You will also be able to change the size of the image as well as rotate and flip it. Tables have been substantially improved, you can now resize any cell, row or column you want. You can now easily customize how you want to paste the text into your emails – you can either choose to keep the formatting or paste it as text only. Calendar invites look and feel way better now. You can now sort any items (emails, contacts, events, etc.) by two criteria at once. When you share a calendar folder with somebody, they will now receive an email with the invitation to your shared folder. Collaboration made easy! We now support automatic “Out of Office” replies for Gmail as well. Let everyone know that you will not be able to respond to their emails by configuring the automatic response right inside eM Client. When someone sends you an image link in chat, you will now be able to see the image they are linking you without having to click on it. Do you like the new features? Is something not working as you expected? Please let us know at info@emclient.com. Thank you for your help, your feedback is always welcome!